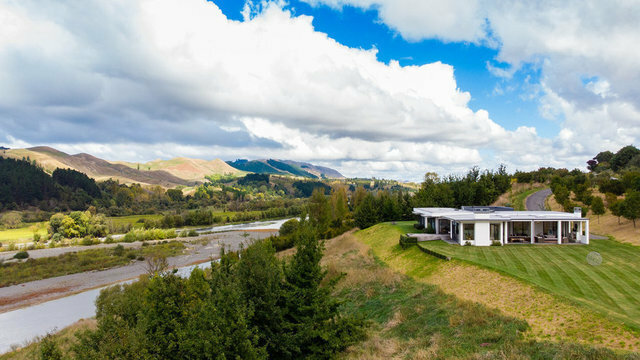 This home has an undeniable wow factor that is achieved through a design that is both architecturally inspiring and functional, offering unsurpassed views of the Tuki Tuki River. Spacious indoor and outdoor living rooms interact seamlessly with clean lines, high ceilings, a modern colour scheme and contemporary finishes and fittings. The open-plan design of the living and dining rooms takes in expansive views of the Tuki Tuki River. The peaceful property boasts a wide river frontage, with sweeping grounds presenting a variety of spacious outdoor areas to relax or entertain guests. It is like a five-star resort, with everything you could possibly need in a luxury home on the river, with indoor/outdoor all-season living spaces. Overlooking the river the gourmet chef's kitchen features a fully-equipped butler's pantry behind a hidden door, breakfast bar and European appliances and accesses outdoor decking overlooking the river vista. Tucked away off the kitchen there's a separate area dedicated for study and privacy, his or hers secluded space. While all of the homes three bedrooms having access to their own en-suite or the family bathroom and the private master retreat features its very own deck, sweeping river views, separate walk-in-wardrobe and luxury en-suite. The homes' substantial undercover terrace living area is suitable for lounging and dining, has a built-in open fire, open paved areas for parties that seamlessly flow to a wide-open lawn space. The property is only 10-15 minutes from the Havelock North village with all its shops, amenities, conveniences and schooling. No expense has been spared in this build, with high end finishes and a luxury fit out you will sure to appreciate.